On the month of Shravan Shukla Pancham day is celebrated as Naag Panchmi. On this day, snakes are worshiped. One can get spiritual power, ability and wealth by worshipping snakes. One can improve Rahu-Ketu conditions by worshiping on this day. If one get dream of snakes or they get fear of snakes then they can worship snakes. On Naag Panchmi, take bath in morning and worship lord Shiva. First, offer water and belpatra to lord Shiva. Then, worship snakes, which is in Shiva’s throat. Offer turmeric, rolli, rice and flowers to snakes. Then, offer gram, kheer, batasha and raw milk. Make snake idol on main gate of with gobar, geru or soil. Also, worship it. Chant “Om Kuru Kulle Phat Swaha” and sprinkle water in the entire home. Do not worship snakes without worshiping lord Shiva. Never worship only snakes. Worship snakes as the ornament of lord Shiva. Those who want mercy of snakes they should avoid land digging and cutting greens. Take one big rope and tie seven knots. Prepare the symbolic snakes with it. Put it on bench. Offer raw milk, batasha and flowers. Also, light Guggal incense stick and chant Rahu-Ketu psalm. Then, open the knots of thread. Flow the thread in running water. Prepare silver snakes and one swastik. Keep snakes in one plate and worship them. Put swastik in one plate and worship it. Offer raw milk to snakes and belpatra to swastik. Chant “Om Nagendraharaya Namah”. Put snakes on Shivaling and wear swastik in throat. Visit such temple, where there is snake on Shivaling. Pour panchamrut on Shivaling in such a way that it run on snake and Shivaling. Offer, gangajal and chant Shiva Tandav psalm or “Om Namo Nilkanthaya”. This avoids bad yoga. Good Luck: There is no Kalsharp yoga. 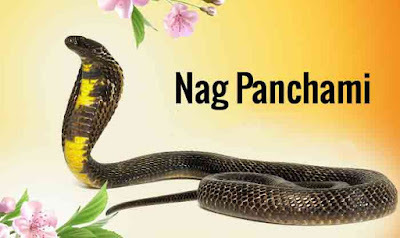 Therefore, do not do any worship on Naag Panchmi.